A large scale hydropower energy development in Rotherham, the first project of its kind in Yorkshire, has begun generating renewable electricity, enough to supply 300 homes in perpetuity. 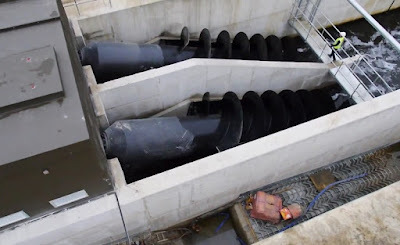 Based on the River Don between Kilnhurst and Rotherham Golf Club, the £2.1m project is one of just a handful of large low-head hydropower (LHHP) developments in the country that are the first to be built since the 1920s. Using twin "Archimedes screw" turbines, it has the same annual output as a 1.1MW solar farm, which would take up around six acres of land. It also includes fish and eel passages which open up another stretch of the river and are part of an ambitious long-term plan to get salmon back up to Sheffield, where they can spawn. Developed by Barn Energy and Yorkshire Hydropower, the Thrybergh Wier site will generate electricity 24/7, 10-11 months of the year, for the next 100 years. It has been completed on time, on budget and with 80% of the contracts placed with British companies, many of them local to the area. Mark Simon, chief executive of Barn Energy: "I am delighted that Yorkshire can boast this outstanding low head hydropower scheme. In making this special project happen, we have worked tirelessly with the Canal & River Trust, the Environment Agency and local interests to ensure that hydropower enriches and repairs the local environment of the River Don, as well as reduce our burning of fossil fuels." John Healey, MP Wentworth & Dearne, added: "It's great to see this type of long-term investment in energy infrastructure, especially as it is generating clean energy and repairing some of the damage done by centuries of industrialisation. I have been struck by the support for this scheme from the local community and the close working between the Canal & River Trust and the project development team. I am pleased Barn Energy's first project in Yorkshire is in Rotherham, and wish them every success with their other schemes." Developers consulted with local angling groups, the Don Catchment River Trust, local neighbours as well as their landlords, the Environment Agency and the Canal & River Trust to ensure that there were no detrimental impacts from the project.